Disclaimer: This post may contain affiliate links to products I love and use every day. This means that I receive a small commission for purchases that are made through these links. You may read our full disclosure for more info. I received products from Dixie Belle Paint Company to complete this furniture makeover. Nightstands have minimal drawers and a small surface area which make them the perfect sized furniture project to tackle over a weekend. If you've never refinished furniture before, revamping a pair of nightstands is a great choice for beginners! 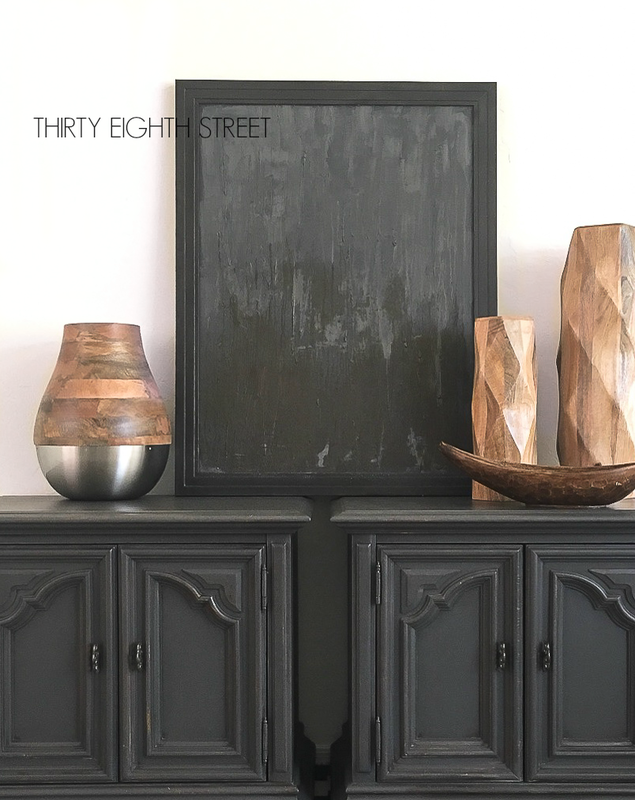 In this post, I'll break down the furniture refinishing supplies that I used as well as the time it took me to refinish these matching nightstands. 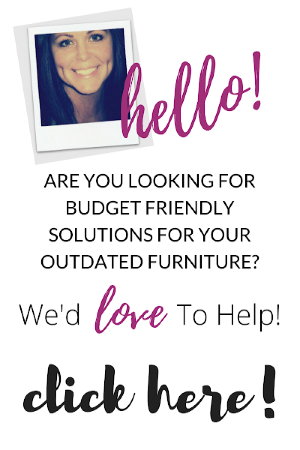 This furniture makeover was quick, easy and I promise I had plenty of time to watch football, attend my kid's soccer & basketball games, clean my house and make run to Costco! These nightstands were filthy. I vacuumed, wiped them down, gave them a light sanding, then scrubbed them with Murphy's Oil Soap and a scrub pad all within a 25 minute time period. If your used nightstands are in good shape you can usually get away with a light sand, vacuum and quick wipe down which will run you closer to 15 minutes. 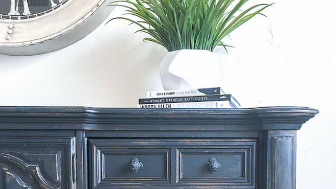 For this furniture makeover, I used a 2.5" Purdy paint brush like this one and the prettiest dark grey paint color called Gravel Road from Dixie Belle Paint Co. 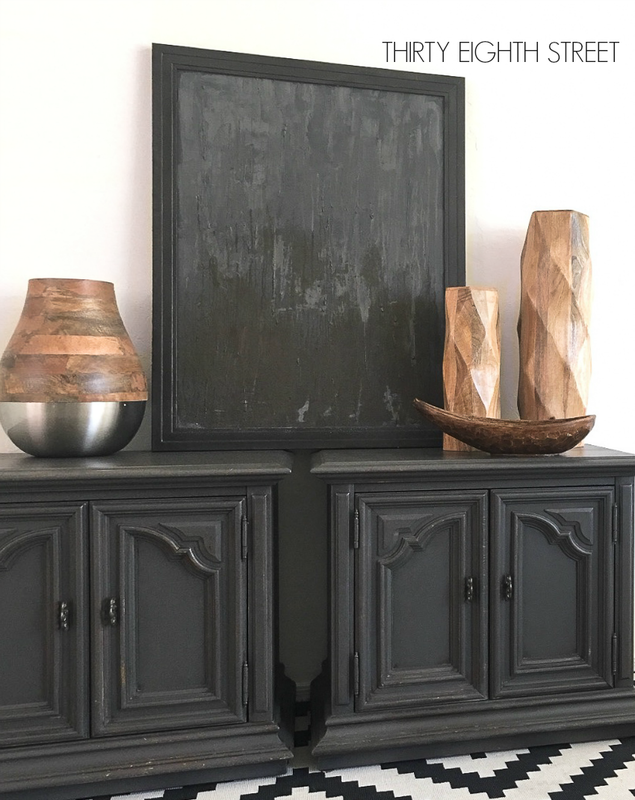 This deep grey hue has a fabulous earthy grey-brown tone to it and it's one of my favorite grey furniture paint colors! Dixie Belle Chalk and Mineral Paint goes on so smooth. It truly is one of the easiest furniture paints to work with! Related Blog Post: I painted these nightstands in Dixie Belle's bold Plum Crazy paint color and loved how they turned out! If you haven't given Dixie Belle Paint a try, I highly recommend it! Because I opted to paint the inside of each nightstand, this step took me close to 30 minutes per coat per nightstand. However, if you decided NOT to paint the inside of your nightstands, you could cut that time in half! The original finish on these nightstands was worn and had lots of dents, scratches and rough areas. I decided to embrace that original imperfections and use those worn areas to my advantage to create a rustic finish. That means I painted less in the areas that were already worn and that allowed me to skip the distressing step altogether! 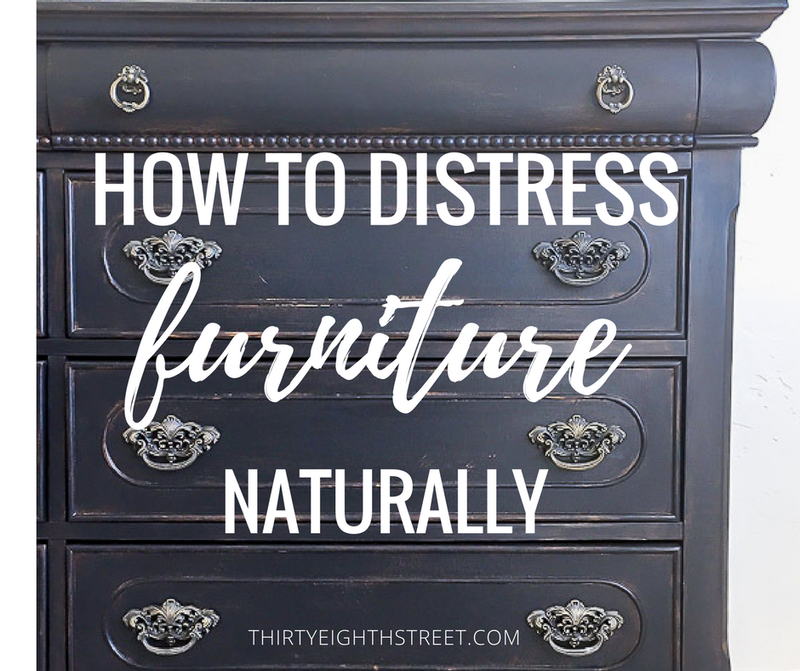 **If you are someone who struggles with distressing furniture, the below link is a must read! 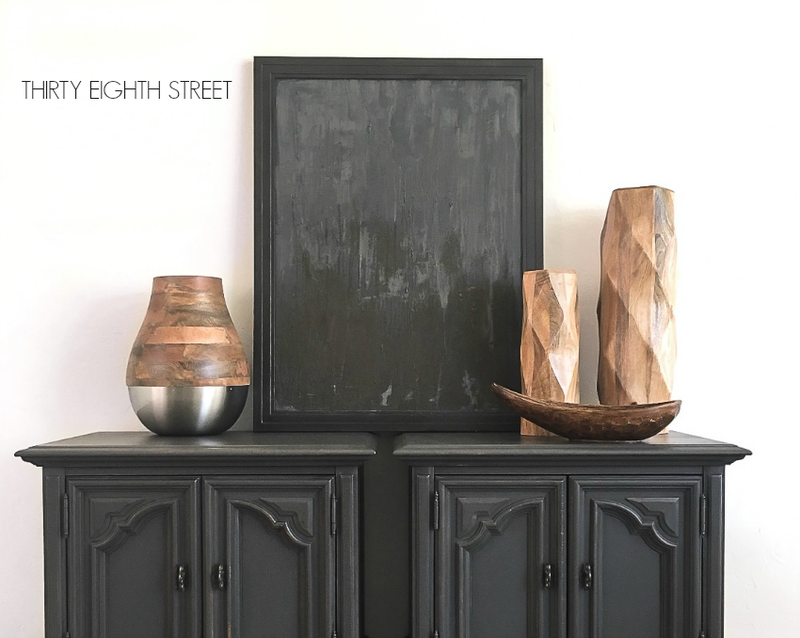 Related Blog Post: Easy Distressing Furniture Technique For A Natural Look! In this fabulous tutorial, I share my secret furniture distressing technique simply by using just the paint on my paintbrush. I used 2 coats of paint on both nightstands. By the time I finished the second nightstand, the first coat on the first nightstand was completely dry. My total paint time was just under 2 hours. Because this paint has zero VOC's, I painted the nightstands inside my home while I watched a movie. Have you seen the movie, Lion yet? It's such a good movie! I highly recommend it! I completed Steps 1 & 2 before noon on a Friday. Saturday afternoon I applied my first coat of top coat. It took me a total of 30 minutes to top coat both nightstands. I ran errands, watched some football and deep cleaned my house during each two hour drying time. I applied a total of 3 light coats for this furniture makeover. 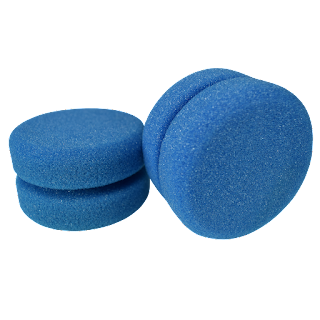 Speaking of which, have you tried these $3 Sponge Applicators yet? They are a game changer and make the top coating process SO easy! I have had virtually NO brush strokes since I've started using these blue sponge applicators to apply my top coat. You rinse them out and reuse them again and again. They are AMAZING! You can find them here for $3! By now you've probably noticed that I spent more time waiting for products to dry then I physically worked to revamp these nightstands! I told you this was an easy furniture makeover! Really, I meant it! If you're considering creating your own furniture before and after you can do this! In less then a weekend, I transformed two old wood nightstands into a rustic pair of end tables in the prettiest shade of grey! Sometimes it can be hard to find the perfect shade of grey! 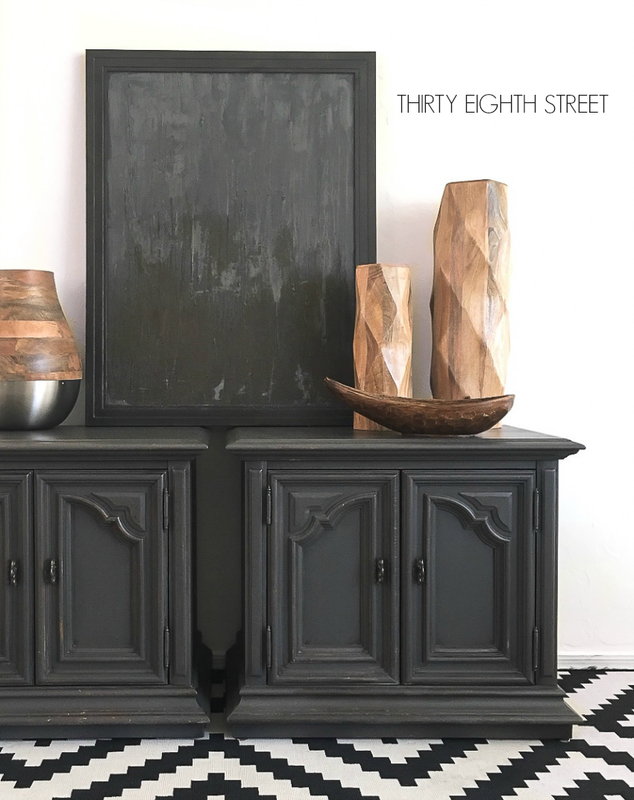 I've tried all of these grey paint colors on various diy furniture makeovers and I love them all! 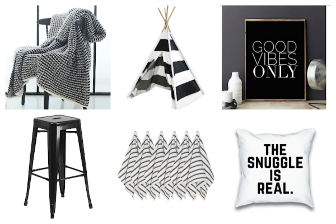 So here's a few recommendations on furniture paint colors in the prettiest shades of grey! I'll put a star next to my favorite grey furniture paint colors. Below you'll find some inspiratonal painted furniture ideas created from thrift furniture. 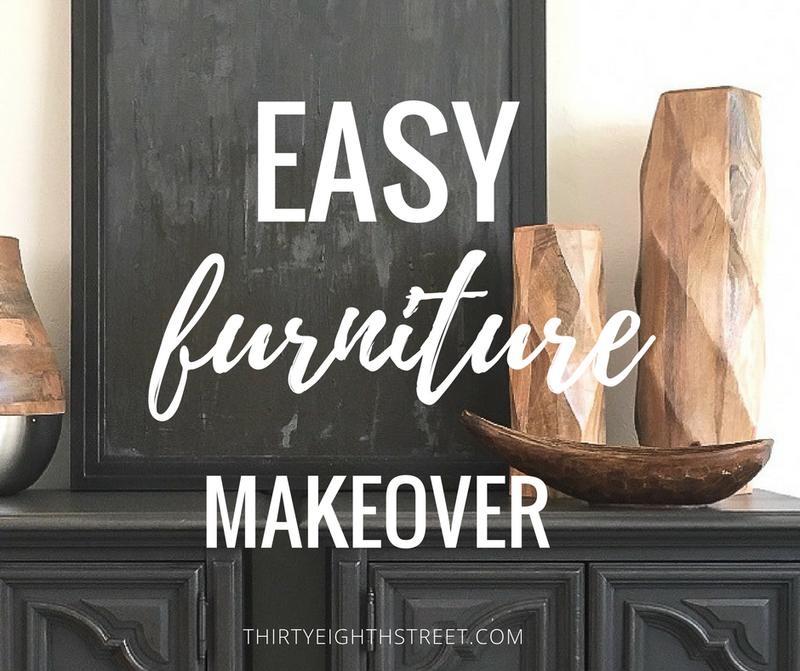 We hope these incredible furniture projects and tutorials will empower YOU to give furniture refinishing a try! These refinishing furniture ideas are here to prove that YES! YOU CAN create beautiful looking furniture on a budget! FURNITURE MAKEOVER WITH WALLPAPER: These wallpaper furniture makeover ideas are fantastic! 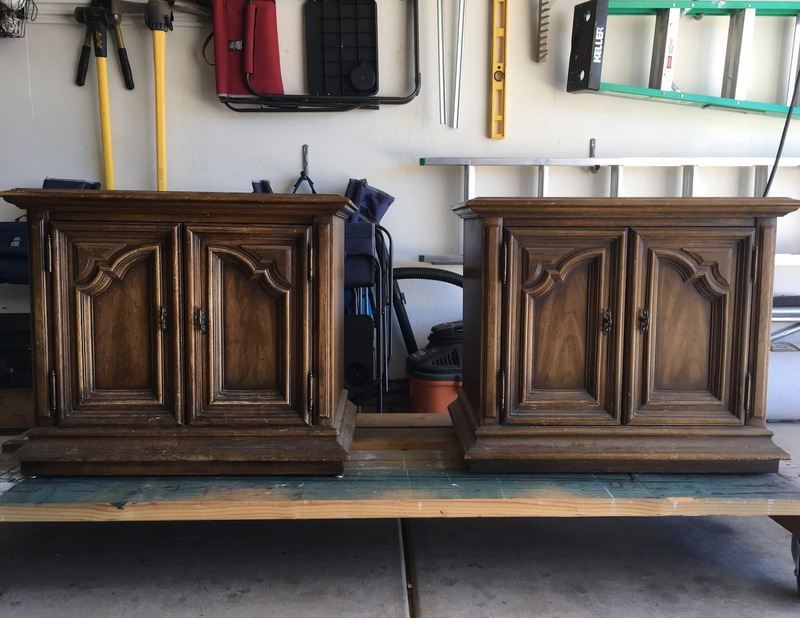 Do you have an old china cabinet that could use a facelift? Maybe this refinishing furniture idea would do the trick! FURNITURE MAKEOVER WITH FABRIC: And old before and after china hutch makeover using fabric. It's easy to create a statement furniture piece using fun prints! DRESSER MAKEOVER IDEAS: Oodles and oodles of painted dresser ideas you'll fall in love with! Get inspired with this round up of our favorite refurbished dresser ideas and old bedroom furniture makeovers. FURNITURE MAKEOVER WITH CHALK PAINT: Here's a painting old furniture idea- come on over and see how we repurposed this vintage piano bench into a relaxing spot to sit! DESK MAKEOVER IDEAS: This old vintage desk was given an artisan furniture makeover packed with personality and flair.. Now it looks more like furniture art! DIY FURNITURE IDEAS: Click here to see our best furniture makeover ideas for lots more furniture refinishing inspiration! 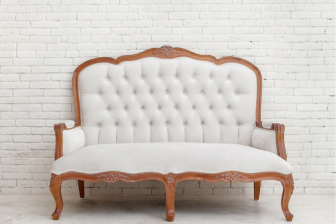 THE IN's & OUT's OF THRIFT STORE FURNITURE: I think you'll find our Ultimate Guide To Refinishing Second Hand Furniture extremely valuable. 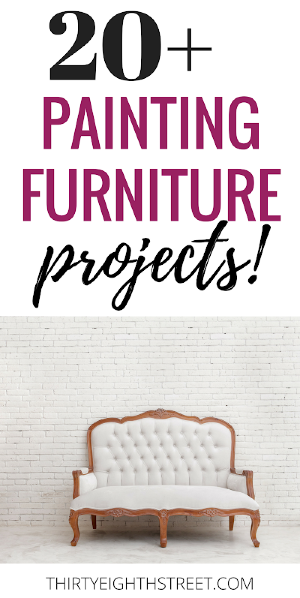 If you're looking for information on furniture makeovers for beginners THIS will be so helpful for you! DIY DRESSER MAKEOVER: You don't have to spend a ton of money to have luxurious looking bedroom furniture. Here's a painted dresser idea that will leave you saying DIY bedroom furniture doesn't look so do-it-yourself! 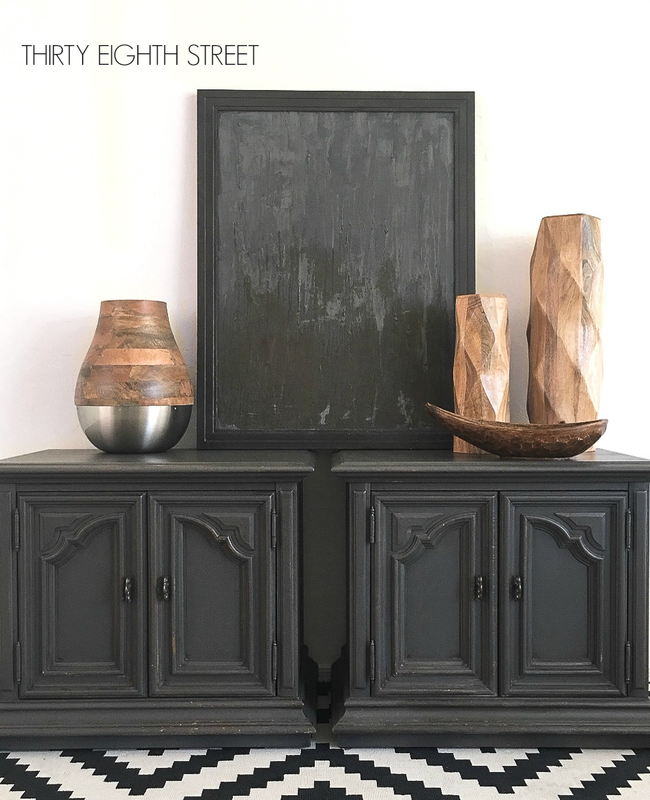 THRIFT STORE MAKEOVERS: This ugly cabinet just needed a little bit of chalk paint and some new furniture hardware to make it shine. For less than $50, we refinished this thrift store furniture and created a beautiful before and after furniture makeover! PAINTED FABRIC FURNITURE MAKEOVER: Before and after furniture makeovers are so fun to look at. Wouldn't you agree?! This painted sofa is no exception. Wait, what? Did you just suggest painting fabric? Yes! And we're going to show you how we did it right here! COLORFUL FURNITURE MAKEOVERS: These refurbished furniture projects were made over in the prettiest, boldest paint colors! Would you paint your furniture in one of these daring hues? Just love how this turned out! Great job! So glad you enjoyed it, Teri! I love the paint color! It makes them look so sophisticated and rich. Great job! This grey has a nice earthy brown undertone to it. I think it may be one of my new favorite grey hues! Never would’ve thought to use the two nightstands next to each other! I’m a beginner so thanks so much for the tips! Love love love the color Gravel Road. Also really liked the tutorial on how you transformed the nightstands. I found it very easy to understand. Thank you! I love Gravel Road too! Such a pretty shade of grey. I'm glad you enjoyed the tutorial, Pam! Thank you, Michelle, you made my day!! What a great color choice! And, your staging is excellent! I think it might be my new favorite grey furniture paint color! Thank you, Bobbie! Glad you enjoyed it! I really love that color and the transformation! Thank you, Kelley! It really is the perfect dark grey hue! Lovely! Gray is my go to color! Is it!? Such a great choice, Deb! I am planning to use you information and create a china cabinet for my log cabin. Thank you~! 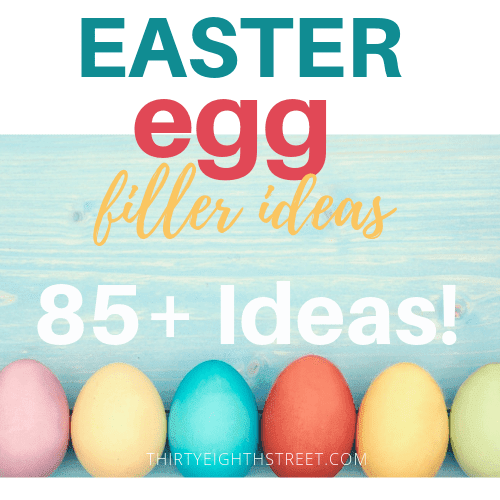 Oooh, what fun project, Dawn! This tutorial gave me some great tips for my son's old dresser which was purchased in the 70's. I've been trying to decide what look I want for its new life. Oh good! I'm so glad to hear it! Have fun with your DIY furniture makeover!! The matte finish works very well for those cabinets. I just love how the very tired looking end tables were able to transformed into beauties in a weekend. Love the "Gravel Road" shade of grey. So inspiring! Thank you!! Paint is magical isn't it!? I feel like it's so hard to find a good grey. This shade looks perfect! It is hard to find a good grey paint color. In different lights, this grey color always looks so pretty! I LOVE the dramatic color you chose for this project! Any idea if Dixie Belle Paint works well in a sprayer? Hi Heather! 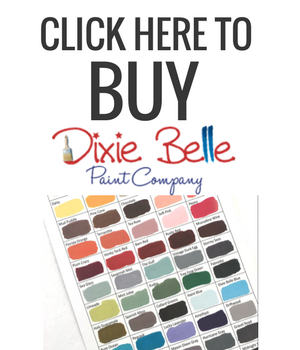 I've never tried Dixie Belle Paint in my paint sprayer, but I bet it would! You would want to add some water to the paint (based on your paint sprayer's instructions) to get the right consistency. The coverage is beautiful! 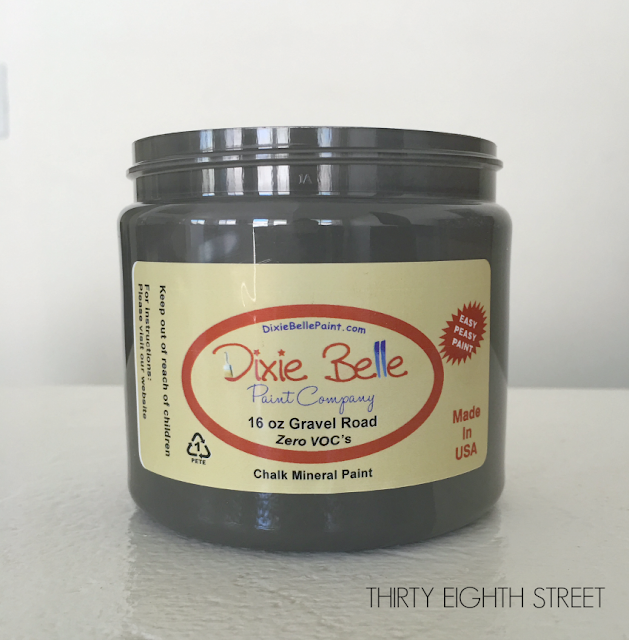 I have never used Dixie Belle paint before and am anxious to try it! So many beautiful colors to choose from... such as the grey in this awesome makeover! Your step by step instructions proved to me how easy and fun it would be to use Dixie Belle paint! You'll love it! Their paint is so easy to use! Love that grey colour! Am hoping they do this paint in the UK!! Isn't it a pretty color!? Oh, I hope they do too!! An interesting techniques. Will try someday. What did you use as a finish? The links included in the blog for the finish do not work. Thanks and I love the color! Hi HC! Thank you! I'm sorry, I'm just seeing your comment now. :( You may have already finished your furniture project?- In case you haven't I used Gator Hide to seal it. The link has been fixed.. thank you for pointing that out!